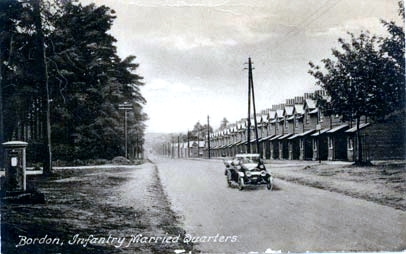 The first major post-War married quarters building programme was carried out during the 1960s, when two new roads were constructed known as Oakley and Beaufort Roads, along which 68 terraced soldiers' quarters were completed between November 1961 and February 1962. Then in 1963 Guadaloupe Barracks, together with the old terraced married quarters in Budds Lane, were demolished and 200 new quarters erected by October 1964. Further modernisation continued in 1965 on the site of San Domingo Barracks, when a new type of construction, called Jespersens, was introduced consisting of factory made components being lowered into position by cranes and bolted together. The first of these 197 quarters was taken over in June 1966 and the whole project was finished by November 1967. During the second phase of this operation, the old terraced married quarters in Station Road were demolished to make way for 80 more of these Jespersens. In 1979, 142 of the Jespersen quarters, which were no longer needed by the military, were leased to East Hampshire District Council and were quickly occupied by Council tenants. On 31 st March 1987, having purchased these houses and adjacent property, the Council decided to demolish them and build the Pinewood Village estate. The commencement of demolition of Exmoor Close was ceremonially carried out by a Chieftain tank on loan from the army and supervised by Captain Rod Paul, in conjunction with the District Council. The most recent build of married quarters was in 1976 when 20 officers' quarters were put up in Bolley Avenue and 200 soldiers' quarters were erected on the site of St Lucia Barracks. 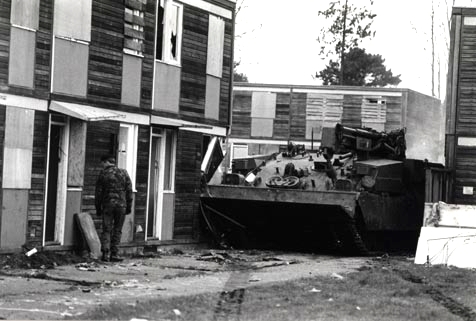 Part of Quebec Barracks was also demolished in 1976 to make way for 92 married quarters for RAF families. In May 2003 RAF Oakhanger was handed over to Paradigm Services and these quarters were no longer needed by the RAF.